Before the Summer Olympics in Beijing, most Americans hadn’t heard of 27-year-old Shalane Flanagan. That changed the night of August 15th, 2008. On the world-famous Bird’s Nest Track before an internationally televised audience, Shalane made history. She broke the American 10,000m record (her own), and she won the Olympic bronze medal—becoming only the second American woman to medal at that distance in the Olympics. Shalane herself didn’t expect it. “Did I do it?” she asked, looking up at the clock. It read: 30:22.22, 3rd place overall. Her running career began to take off in college at the University of North Carolina. There, in 2002, she won the first NCAA cross country title in the school’s history. She won the title again in 2003. In 2004 and 2005, she was the U.S. Cross Country champion at 4K. The beginning years of her professional career, 2005 and 2006, however, were difficult ones. She underwent surgery to remove an extra bone in her foot and was sidelined. But in 2007, she began an unparalleled comeback. At the Reebok Boston Indoor Games that year, she smashed the American record at 3,000m by 6 seconds (8:33.25). Outside on the track, she also broke the American 5,000m record (14:44.80). Shalane moved up to the 10,000m event in 2008. In her debut race at that distance, she broke the American record by 17 seconds, running 30:34.49 in May. A month later, she went on to win the Olympic Trials 10,000m, setting a Hayward Field record (31:34.81). Shalane grew up in Marblehead, Massachusetts. She is from a family of distance runners. Her mother, Cheryl Treworgy, competed on the U.S. World Cross Country teams in the 1960s and 1970s and her father, Steve Flanagan, has a 2:18 marathon PR. She currently lives and trains in Pittsboro, N.C. She is married to former University of North Carolina runner, Steve Edwards. Take The Magic Step writer Duncan Larkin spoke with Shalane about her successes and dreams. Shalane: I don’t know. I am just motivated at the end of the day to find out how good I can be. Whatever that is, it is. I’ve always just enjoyed the pure essence of just running. I enjoyed getting out there and being in nature—it’s just a natural sport. In general, I just love running. I want to find out how good I can be when it’s all said and done. You are a very versatile runner—competing in a wide range of distances from 1500 meters to the 10,000m. Do you feel that your leg speed, the turnover that you have to have in order to compete in the 1500m, helps you at the end kick of the 10,000m? Shalane: Absolutely. The 1500m is not a natural event for me; sprinting itself is not natural. If anything, I’ve had to really work on a kick, if you want to call it a kick. I really had to work on my speed. I hope to do that in the next few years, to continue to work on that, because it isn’t natural. What is natural is being able to run long and not get too tired. It’s definitely not natural for me to sprint. So I had to work on it—through form drills, through sprint drills, just practicing sprinting. Before I met my coach [John Cook], I was never actually asked to sprint. It wasn’t pretty the first time. He said, “We are going to do 30-40m sprints.” To be honest with you, it felt really awkward. I’ve had to really work on that. So you do think that this speed that you work on with your coach helps your kick for the longer races? Shalane: Definitely. 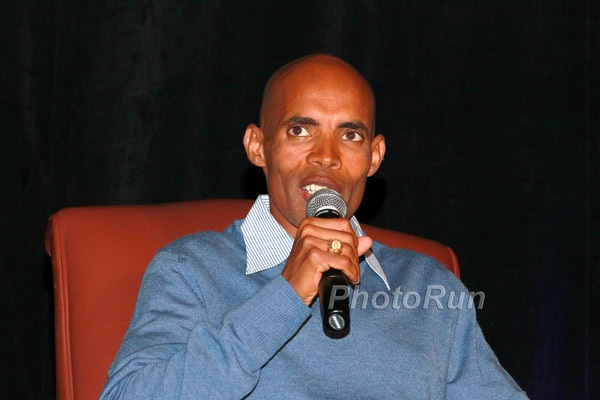 It helps me keep my form together; it makes me conscious of what I need to do to be faster. You hold the American records in the 3,000m, 5,000m, and 10,000m. So what’s next? It seems like you are at a point where you could drop down and compete in the middle-distance races or move up to the half-marathon and marathon. Which will it be? Shalane: My desire, my gut instinct actually, is to move up, because I’ve had a lot of fun with the 10,000m. 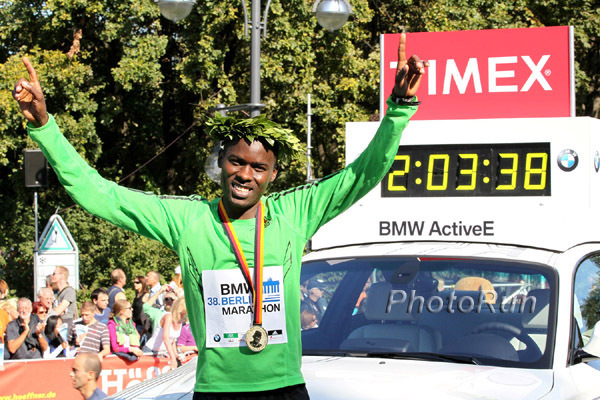 I think in order to be a good marathoner, I have to get a lot faster, I believe. I think I need to get back on the track and develop my speed in the 1500m through the 5000m races. I will work on those events and get those credentials on the track before I transition to the marathon. I really love the marathon. I get so excited watching the New York City Marathon. I get so inspired and want to run one. I know that I have to be patient. I just hope the marathon likes me as much as I like it. [She laughs.] I mean I say that I like it now that I’m sitting in a chair. Growing up in Boston, the marathon has been a way of life for me. Until I run Boston, I know I’m not a true, credentialed runner. [She laughs again.] I’m looking forward to that phase, but it won’t be for the next two years for sure. So if you’re going to focus on the shorter races on the track for the next two years, does that still leave open the possibility of running the Olympic marathon in London four years from now? Shalane: I have to barter with my coach on that one. 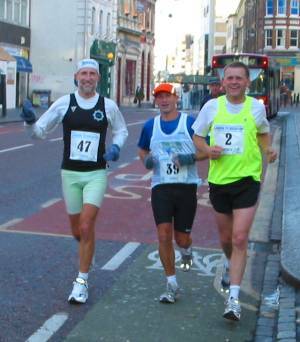 I think I could do well in a marathon and I’d love for it to be 2012. It just might not be in the cards. I don’t know. I’d be excited to just be at the 2012 Olympics in any event. We’ll have to see how the next four years progress—if I can be strong enough to run a marathon, I’d love to. One of Take The Magic Step’s primary goals is inspiring people across all ranges of talent to enjoy the benefits of exercise. On your Web site, you have the following quote posted: “Dream big.” What would be your strongest suggestion to young talent or people just starting to exercise for the first time in their life? Shalane: I’ve always felt that no one should ever limit themselves. They should always think big and dream big. Try to commit yourself to some level of excellence, whatever you want that to be. I personally got interested in running by just being around other people. I like the social aspect of running and I also like the solitude. To people just starting out, I just tell them that the best thing is to have someone to meet you to run with—to hold you accountable if you really have goals that you want to set in running. I find that having camaraderie can really develop special memories through running and to share the whole experience through people. In 2005 and 2006 you struggled with a foot injury. That was obviously a setback for you. Was there ever a moment where you wanted to quit running? Shalane: I never have thought that I was going to give up. If you listen to anyone who has gotten to the top, they have always had a bump in their road. I have never known anyone who went directly to the top without a small setback. I don’t call them setbacks, actually. They just mold you into a tougher person. If I hadn’t had that injury, I wouldn’t have reevaluated my love of running. It made me reevaluate a lot of stuff—how serious I was to this sport. I asked myself: Is this the right coach? Is this the right training? I think what truly seems like a bad situation is there for a reason. My husband [Steve Edwards] sometimes says that bad things happen for a reason. I believe it happened for a reason: for me to reevaluate my goals and my commitment to the sport. I believe that the down times lead you to be a stronger person. Besides running, do you ever use any other sports for cross training? Shalane: Yes. My coach always preaches that to be a good runner, you have to be a good athlete. We spend a lot of time doing other stuff besides running—especially during this time of year when we are kind of getting back into training. We supplement a lot of our miles with yoga, biking, swimming, and working on our core strength. Whatever weaknesses we have, we work on. My feet are definitely my weakness, so I work on them at this time of the year. Whatever the area that is weak at the end of last season, I attack at this point. I love this time of year, because everything is different. I’ll do yoga tomorrow night; today I swam. I may bike on Friday. We are into the whole integration aspect of it. Does it help break up the monotony of running as well? Shalane: Yeah; it’s everything. It’s using the different muscles; it’s using your brain differently. I love this time of year. You had an incredible experience at the Olympics, was there anything special that you wanted to tell us about? 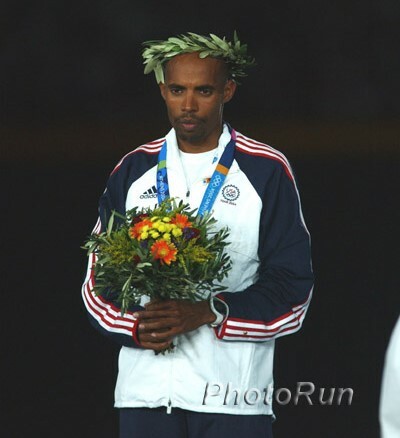 Shalane: One of my favorite moments for my husband and I was the night after the 10,000m. It was really late and we had drug testing and when I finally got out of drug testing, they had shut down the warm-up track and we really had no place to cool down. I still had the 5000m and it was essential to get a cool-down in, so the only place to run was in the Olympic stadium in the Bird’s Nest. It was really special that we were able to run the cool-down on an empty track. No one was there besides me, my coach, and my husband. We were able to run for 10 minutes. It was a nice way to savor the moment. I got whisked off the track; it was a whirlwind. To think: Oh my Gosh, this is the track that it happened on! We had worked so hard together. My husband has helped me so much with my training. He does massage—everything. It was really special to share the moment together, to capture the whole event together. That was the highlight for us. And then in terms of just international experience with my competitors, I’ve always really admired Meseret Defar. I’ve run against her a couple of times indoors. I just really like her personality a lot even though we don’t speak to each other because of the language barrier. She came up after I had won the bronze in the 10,000m. It was at the 5000m prelim.—maybe we were in the same heat. She gave me a kiss on the cheek and said, “Congratulations.” You could tell that she was genuinely happy for me. That was pretty special. I’ve always admired her. I think she’s a great individual and a great ambassador for the sport and for my generation.